Starting a month of shows about the depiction of travel in comic books and representations of far flung lands, Alex Fitch talks to creators from Brighton and Delhi about their graphic novels which mix autobiography with fantastical elements. Gary and Warren Pleece discuss The Great Unwashed, a new collection of early self-published and small press work now available as the first release from Paul Gravett and Peter Stanbury's Escape Books in 20 years; stories within include tales of piracy, gangsters and magical realism from contemporary Brighton Pier to 1970s New York and a prologue to their next release, Montague Terrace. 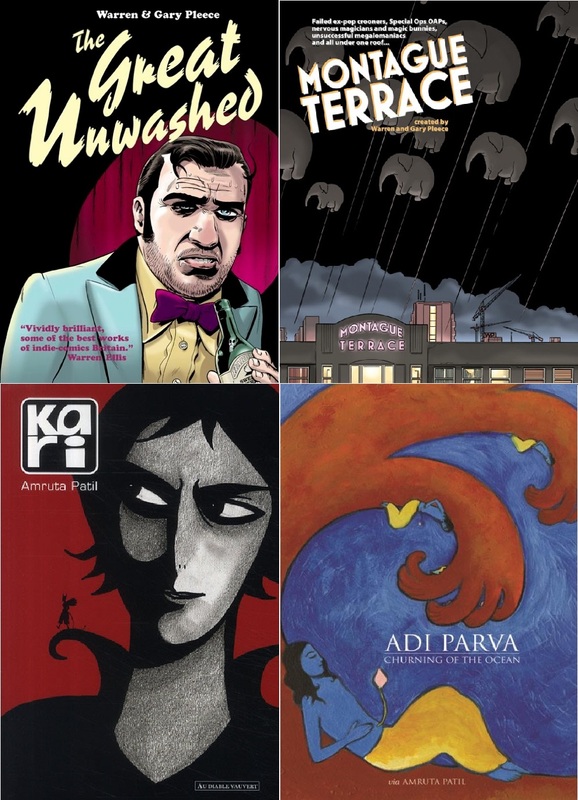 Amruta Patil discusses her graphic novels Kari and Adi Parva which respectively tell the story of a young lesbian and her group of friends and acquaintances in a modern day Indian city, and a fully painted adaptation of the first book of The Mahabharata, both available from Harper Collins. 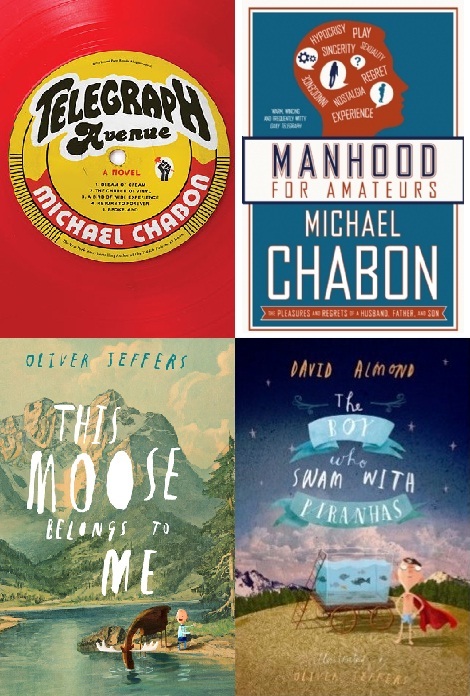 In this month's Book List Clear Spot, Alex Fitch talks to author Michael Chabon about his latest novel Telegraph Avenue and his collection of autobiographical essays, Manhood for Amateurs, which both display the writer's love of collectables and ephemera from comic books to lego, Blaxploitation films to classic funk records. 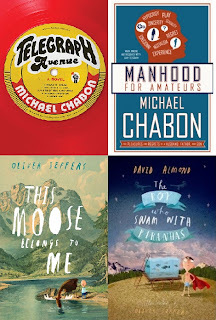 Also in a Q and A recorded at Waterstones, Piccadilly, Sarah McIntyre talks to author David Almond and illustrator Oliver Jeffers about their collaboration on The Boy who swam with Piranhas and Jeffers' latest picture book, This Moose belongs to me, which combines the artist's use of painting, collage and word balloons to create a fable about collectivism for younger readers! The fifth annual Dundee Comics Day will be taking place at the University of Dundee on Sunday 28th October 2012 and, as previous reported, will be dedicated to talks by writer Grant Morrison and his artistic collaborators Cameron Stewart (Batman), Frazer Irving (Batman), Frank Quitely (All Star Superman), Rian Hughes (Dare) and Jill Thompson (The Invisibles). An added extra to the event is what was initially vaguely described as a two hour comics workshop on the Saturday afternoon. The details of this have now been confirmed and it has turned out to be rather more impressive than originally envisioned. 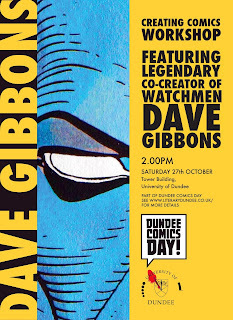 Saturday 27th October 2012 sees artist and writer Dave Gibbons giving a two hour show and tell about his work plus giving a demo of the Manga Studio artist's tool. 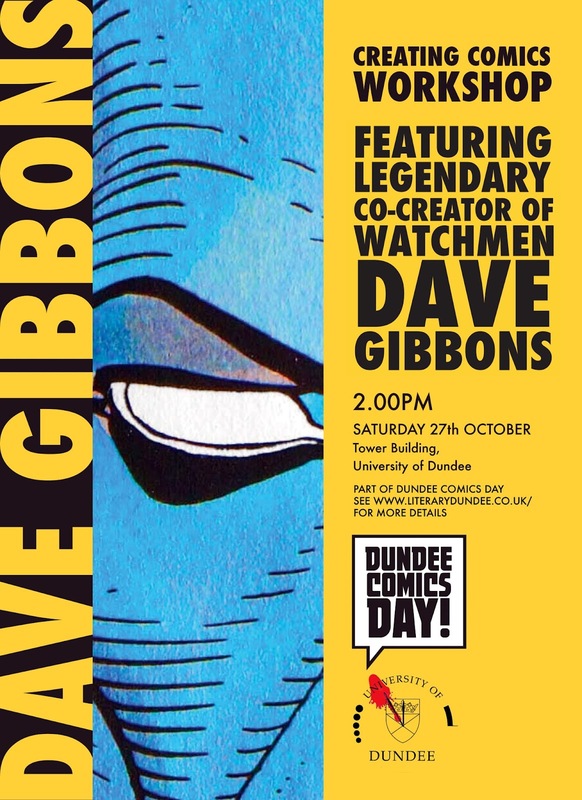 This will begin at 2pm on the Saturday and the cost of entrance is included in the ticket for the main Dundee Comics Day, meaning the the £15 ticket covers the holder for entry to both the Dave Gibbons presentation on the Saturday and the full day of Grant Morrison goodness on the Sunday. • There are more details of the Dave Gibbons event on its Facebook page. Aces Weekly (www.acesweekly.co.uk), an exclusively digital comic art magazine featuring some of the world's finest sequential art creators launched at the weekend and offers a fine mix of strips and creators, combining adventure, science fiction and humour. The brainchild of V For Vendetta co-creator David Lloyd, edited by veteran comics creator and form Marvel UK editor Bambos Georgiou, has gathered together top talents from the US, UK, France, Belgium, Spain, Italy, China, New Zealand and the Philippines in this unique publishing project. Seven weekly issues form a volume of Aces Weekly for a total cost of just £6.99/$9.99/€7.99 and are accessible once you subscribe on the site. The comic is not available for download from any other on-line site, and is available exclusively digitally. A volume of Aces Weekly will contain at least 126 pages of top quality comic strip material as well as copious extras such as character sketches, line drawings and unlettered artwork. After the first seven issue volume of ACES WEEKLY has been published on-line there will be a two week break before the next volume begins. As long as you have an internet connection you can access your Aces Weekly volumes from your home computer, laptop or tablet device. Just type in your password and you’ll be able to read whichever volumes you’ve subscribed to. Forthcoming artists include Kyle Baker, Bill Sienkiewicz, Steve Bissette, Herb Trimpe, Marc Hempel, Yishan Li, Dylan Teague, Henry Flint, James Hudnall, Val Mayerik, Hunt Emerson, Roger Langridge, Dave Hine, Paul Peart Smith and many more. Lou Scannon and his ragtag band of mercenaries have responded to a distress call from a trashed government research station. Now our anti-heroes find themselves trapped on the station with the very beast that destroyed it and killed its crew! With about a billion* homages to Aliens and Predator, the fourth issue of this strong-selling adult sci-fi/comedy British indie comic is the funniest and most action-packed yet, the creators tell us (and backed that up with a threat of nuclear weapon use, so we believe them, honest). It's got beasts that lurk in the shadows! Experimental weapons wielded by genetically engineered weapons experts! It's got a forklift truck! And it's got a twist that will take off and nuke your socks from orbit - it's the only way to be sure! 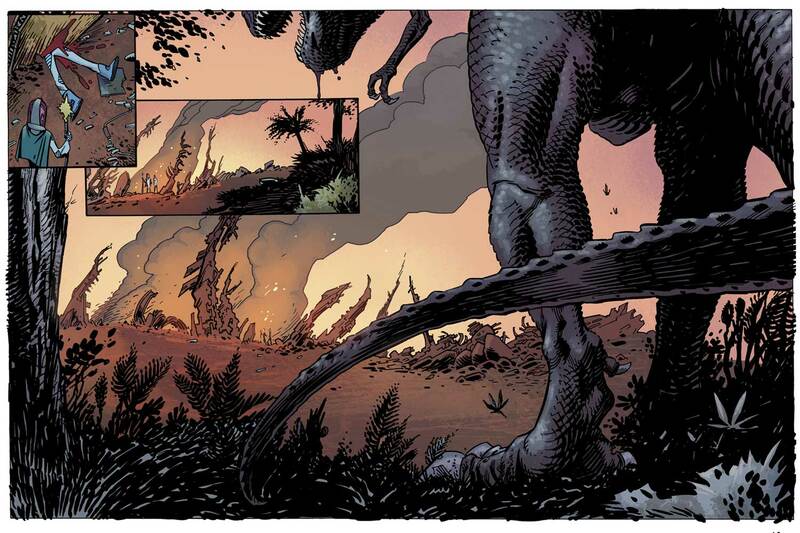 Lou Scannon Issue Four is great fun throughout, with a twist that will have your head spinning in four dimensions. The title's rapidly developing a firm following and both script and art a delight. We recommend this, and we're not just saying that because we're frightened of their guns. The fourth issue of this Eagle Award finalist from Dan Harris, Jim Bampfield and Kris Carter is now available to buy from www.louscannon.co.uk, and soon from Forbidden Planet Cardiff, Fish 4 Comics (Cardiff) and Orbital Comics (London). 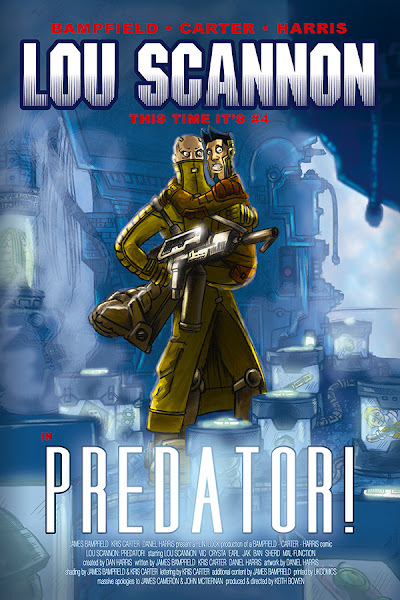 • If you'd like to catch up with the Lou Scannon creators, they will be at the one day Cardiff Comic Con event on 4th November, and at Thought Bubble in Leeds on 16th-18th November. While the Mayan civilization has proclaimed 2012 to be the end of the world, F.A.C.T.S. – a Belgian convention organized once a year by Con-Fuse bvba, an organisation promoting Science Fiction, Comics, Fantasy and Japanese animation – found it appropriate to invite "zombie-guests" for 20th - 21st October 2012 and to celebrate the event even more F.A.C.T.S. has developed a ZOMBIE-COMIC with the help of the artists invited to the show. 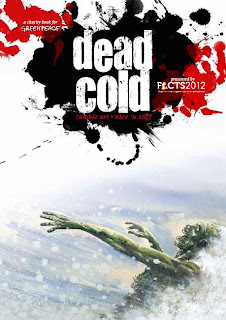 "I really do not care much about this heralded End of the World so inviting Zombies - or rather guests in movie and comics, who have something to do with the zombie-phenomena - is entirely making sense to me, in a 'living life on the edge' kinda way", said Emmanuel van Melkebeke, F.A.C.T.S. Convention Director. "and this year we have something amazing, as many artists have supported the idea to publish a Zombie Comic – with all profit going to charity!" Artists included are Sean Philips, Paul Duffield, Dean Yeagle, Colin Wilson, Tyler Kirkham, Lectrr, Romano Molenaar, Louis & Lamirand, XA, Emmanuel Nhieu, Popescu, Kristof Spaey and Sophian Cholet. 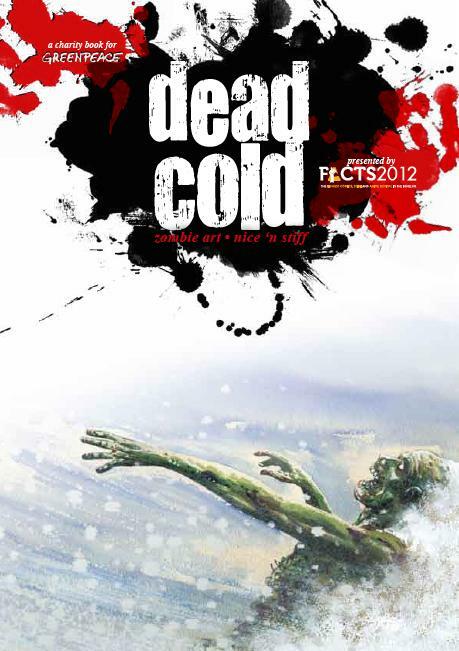 The cover will be provided by Guest Of Honor Charlie Adlard, who also provided an introduction as well as picked Greenpeace as beneficiary to the proceedings of this special edition, called “Dead Cold… zombie art”. F.A.C.T.S Convention is the signature pop culture event of the Benelux, presenting guests and programming to cater for the top segments of the comics, anime, sci-fi, film, TV, and gaming industries. Entering its 22th edition, F.A.C.T.S. is expected to draw over 21,000+ attendees to its October 21-22, 2012 convention held at the Gent Flanders Expo Convention Center located in Gent, Belgium. The show will sport 3,000 extra meters compared to its last edition and will now have 15,000 square meters. FACTS will host over a mile of dealers of toys, comics, movie merchandise, fantasy merchandise, manga and will see 2,500+ cosplayers and a cosplay competition, life size props, model kit exhibitions, an entire fan-village, a Japanese Village, a huge game zone with dozens of consoles, as well as loads of surprises, to brighten up the already amazing venue!